KUALA LUMPUR, Malaysia (AP) — Murky satellite images that a Chinese science and defense agency said may show debris from the missing Malaysian Airlines jetliner provided a fresh clue Thursday in the search for the plane, pointing searchers to a location nearer to the plane's original flight path south of Vietnam. The revelation could provide searchers with a focus that has eluded them since the plane disappeared with 239 people aboard just hours after leaving Kuala Lumpur for Beijing early Saturday. 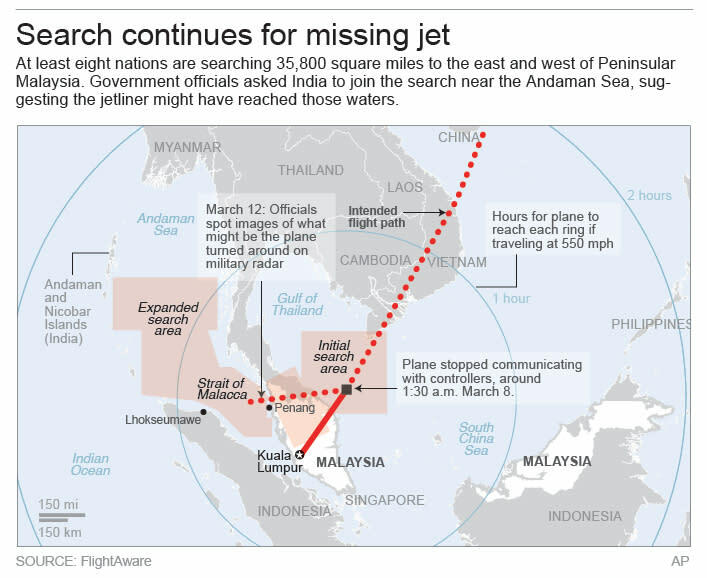 Since then, the search has covered 35,800 square miles (92,600 square kilometers), first east and then west of Malaysia and even expanded toward India on Wednesday. The Chinese sighting, if confirmed, would be closer to where the frantic hunt started. The Xinhua report said the images from around 11 a.m. on Sunday appear to show "three suspected floating objects" of varying sizes in a 20-kilometer radius, the largest about 24-by-22 meters (79-by-72 feet). The images originally were posted on the website of China's State Administration of Science, Technology and Industry for National Defense. That site reports coordinates of a location in the sea off the southern tip of Vietnam and east of Malaysia. Malaysia's civil aviation chief, Datuk Azharuddin Abdul Rahman, said Malaysia had not been officially informed by China about the images, which he said he was learning about from the news. He said if Beijing informs them of the coordinates, Malaysia will dispatch vessels and planes immediately. "If we get confirmation, we will send something," he told The Associated Press early Thursday. Until then, he urged caution. "There have been lots of reports of suspected debris." On Wednesday, it was revealed that the last message from the cockpit of the missing flight was routine. "All right, good night," was the signoff transmitted to air traffic controllers five days ago. "There's too much information and confusion right now. It is very hard for us to decide whether a given piece of information is accurate," Chinese Foreign Ministry spokesman Qin Gang said in Beijing. The amount of time needed to find aircraft that go down over the ocean can vary widely. Planes that crash into relatively shallow areas, like the waters off Vietnam, are far easier to locate and recover than those that plunge into undersea canyons or mountain ranges. Much of the Gulf of Thailand is less than 300 feet (91 meters) deep. 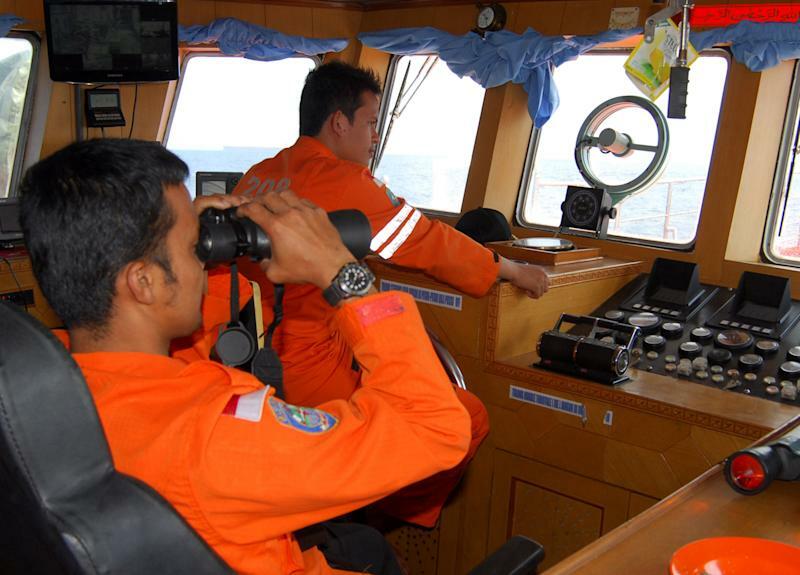 The Malaysian government said it had asked India to join in the search near the Andaman Sea, suggesting the jetliner might have reached those waters after crossing into the Strait of Malacca, 400 kilometers (250 miles) from the flight's last-known coordinates. Malaysian officials met in Beijing with several hundred Chinese relatives of passengers to explain the search, and to relay the last transmission that Malaysian air traffic controllers received before the plane entered Vietnamese airspace, according to a participant in the meeting. Two U.S. Federal Aviation Administration technical experts and a regional representative are in Kuala Lumpur as part of a National Transportation Safety Board team supporting the investigation. Experts in air traffic control and radar are providing technical help, the board said. "It's not something that is easy. We are looking at so many vessels and aircraft, so many countries to coordinate, and a vast area for us to search," he told a news conference. Associated Press writers Jim Gomez in Kuala Lumpur, Aritz Parra and Isolda Morillo in Beijing, Niniek Karmini in Jakarta, Indonesia, Joan Lowy in Washington, Cara Anna in New York and Rod McGuirk in Canberra, Australia, contributed to this report.